We docked at Kusadasi around 11:00 and the kids left for their tour of Ephesus. 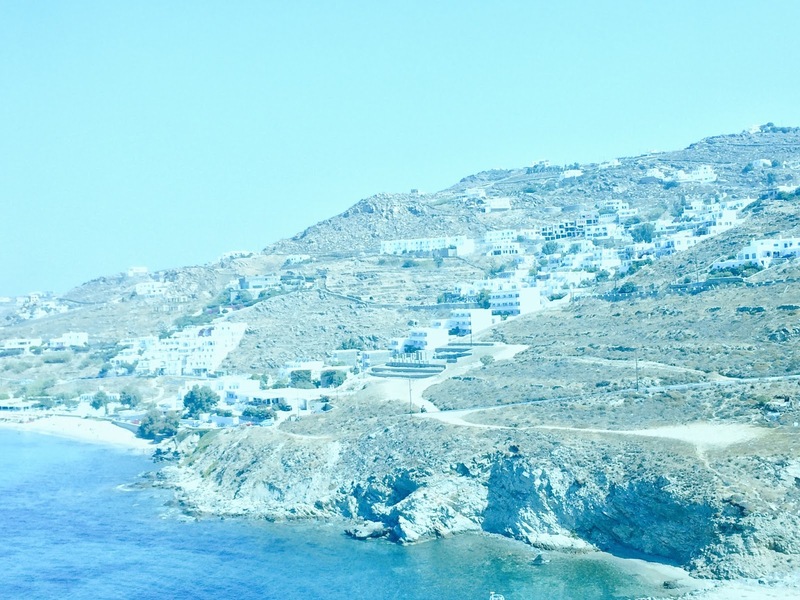 I had originally planned to accompany them, but the heat and my experience at Santorini changed my mind. I had the good fortune to visit Ephesus on a previous trip, so didn’t feel too badly about missing it this time. When they returned, they confirmed my choice — it was extremely hot and they climbed around into the terrace homes that had not yet been excavated when we were here before. They had an excellent guide and were very happy with their experience. 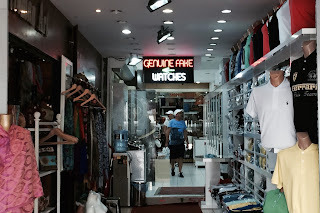 Dan and I did leave the ship and wander around the shops in the town. Carpets and leatherwork were the main goods (and jewelry, of course). We saw gorgeous silk carpets, very finely made. And some of the leather jackets were tempting, but we resisted. Today we have been in Mykonos. The all-white houses on this island are beautiful. But it is very dry and, again, very hot. This large cruise ship is quite amazing. There are 15 decks (but no number 13). We are on Deck 7, which is all staterooms except for a small area called The Hideaway. The Hideaway has comfortable chairs and a coffee/tea machine. 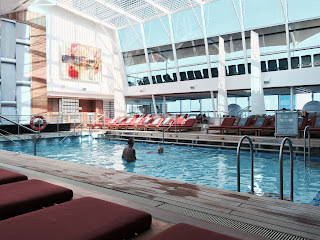 It overlooks the atrium, which is open from Deck 3 all the way to the top of the ship. There are two banks of elevators, fore and aft. We are quite far forward. Food services are all at the aft end — the major dining restaurant on Decks 3 and 4, specialty restaurants (for an additional fee) on Deck 5, and the buffet on Deck 14. Breakfast and lunch can be had in the dining room by menu, at the buffet with a wide variety of options, and at the Spa Cafe which has light options — muesli, smoothies, fruit, etc. We end up most frequently in the buffet area. We have a spot we try to meet up at from the various activities and locations where we’ve all been. We eat dinner every evening in the main dining room. We have the same waiter and sommelier (wine steward) who have gotten to know us and are very friendly. There are many bars on the ship and we often go to the Molecular Bar before dinner. They serve interesting cocktails and the bartender sometimes makes me one without alcohol if there are no other passengers there. 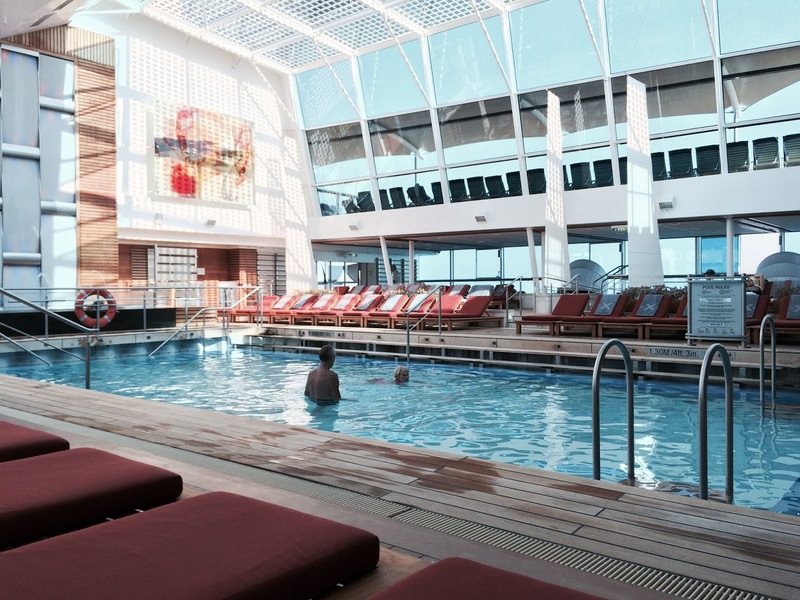 Deck 14 also has the outdoor swimming pools and hot tubs, and a solarium area that is enclosed, with a pool. I have been able to swim laps in the pool most days, as it is rarely crowded. Children under 16 are not allowed, which helps it to be a calmer place. Both Decks 14 and 15 (open to the sky) have many chaise longues to lie on, either in the sun or not. On sea days it can be hard to find a spot unless it is staked out early. The library on Deck 10 is a popular place. I was happy on the first day to find a book that was on my to-read list: Euphoria by Lily King. It is about three anthropologists in New Guinea in the 1930s, inspired by some events in Margaret Mead’s life. I finished it quickly and passed it on to Tracy, who is passing it on to Anjali! Decks 4 and 5 have the shops and common areas. The Reflection Theater is a very large entertainment venue with Las Vegas-style shows most evenings. There is a movie theater (although the movies can also be seen on the in-room television) and a conference center. A coffee shop is a popular hangout for our family. 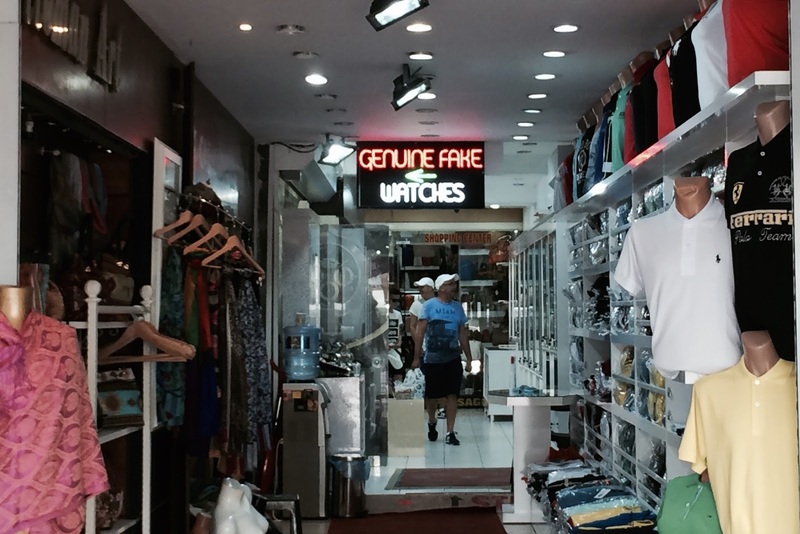 The shops are mainly high-end designer perfume, jewelry, handbags, etc., of absolutely no interest to any of us! Dirk and I like to think we are good at trivia (and we are, really!) but we haven’t done all that well at the daily trivia events we have been attending. The only time our group won was a movie quiz when all six of us formed a team. Domingos pulled us through to the top spot. Yes, cruising is a bit decadent, and the food is over the top, but it is a wonderful opportunity to spend this time with our kids and we are enjoying every minute of it!